Once in a while someone from the media contacts me. They all ask similar questions. There are two specific questions that they always ask. "What was the worst toilet you ever saw?" and "What was the best toilet you ever saw?" 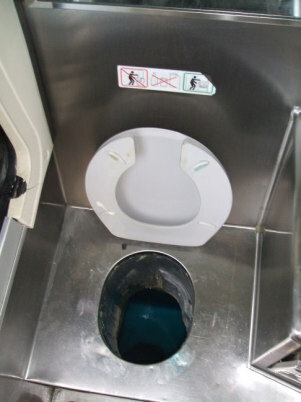 Many inter-city buses have toilets on board. 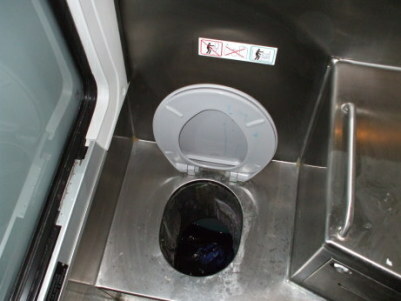 In an absolute sense, the toilet on board a long-haul bus will be among the worst toilets you are likely to encounter. Crude, uncomfortable, and smelly. But the best toilet in the world is the one that's available when you really need it, when not having one would be a disaster. When you have to stay on the bus for another hour or two, a bus toilet can be the best toilet ever. Let's check out some bus toilets. 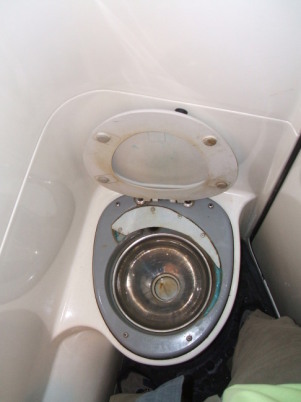 Yes, many inter-city buses have toilets on board. 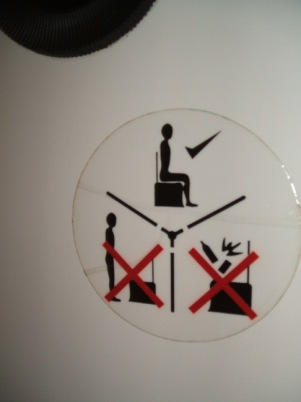 No, a bus toilet is not going to be the nicest toilet you have ever encountered. Not in any absolutely sense, anyway. 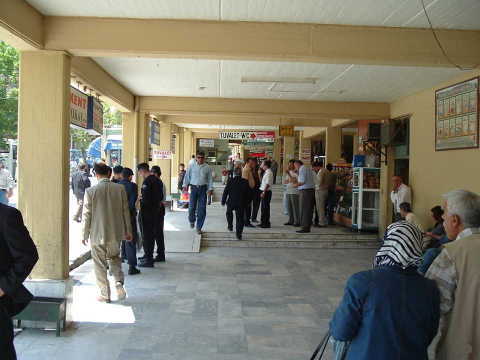 But keep in mind that inter-city buses often travel for a few hours between stops. Even when you do stop, it may be very brief and along the side of the road or otherwise without any plumbing or other facilities. So, these on-board bus toilets can come to look pretty good! 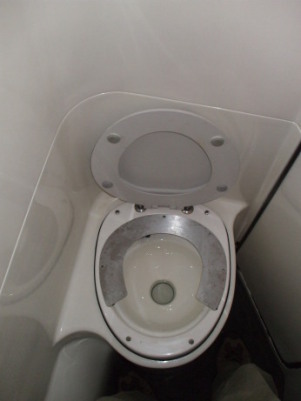 Let's take a look at bus toilets from several countries: Greece, Turkey, the U.K., and the U.S.A.
KTEL, the national bus company in Greece, has some buses with on-board toilets. Most of the on-board bus toilets I have seen are at the right rear, replacing maybe two rows of seats. The Greek ones, however, are down in the center stairwell. They look like they would be awfully small. 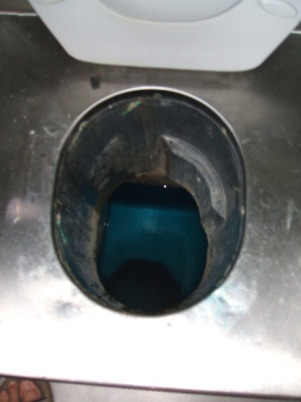 I don't know, and I can't put the blue Sani-Flush border around this picture, because they seem to routinely be locked shut. Yes, they have toilets. But you can't use them. National Express buses in the U.K. also have on-board toilets. This is from an overnight bus from Edinburgh to London. That takes about seven hours. They do stop once or twice along the way so you can get out and move around. They may stop just one time on the overnight run, so you will likely want to use the on-board lavatory. 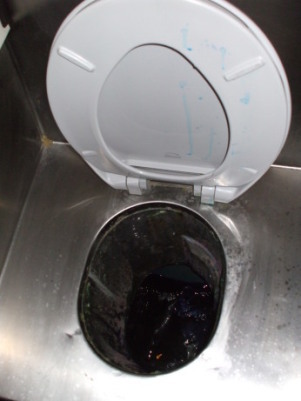 They are not as nasty as American Greyhound on-board toilets. A flap seals off the holding tank. That also helps to keep things clean. Citylink buses connect cities and towns within Scotland. As bus toilets go, these are the nicest that I have encountered. They are constructed about like aircraft toilets, and they are very clean. 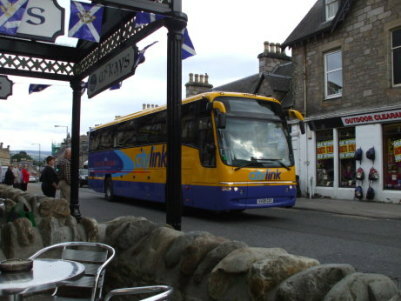 Here we see a Citylink bus passing through Pitlochry, Scotland on the route from Edinburgh to Inverness. Yes, Greyhound buses in the U.S. have on-board toilets. They have a holding tank with the traditional blue juice. I was surprised to see that the design is just a straight drop down a wide shaft into the tank. I would think that the toilet could get awfully smelly on a long hot trip. There is a small air vent directly to the exterior just to the right of your head if you were sitting on the seat. The above is from a Greyhound bus between Lafayette, Indiana and Chicago. Megabus, one of Greyhound's competitors, connects major cities with luxury buses that you can board without venturing into the always dicey Greyhound terminal. Greyhound's market seems to be partially based on brand loyalty based on fond memories of rides home from prison. Anyway, the Megabus buses are quite nice, and they include an on-board lavatory. But as you see here, they're very similar to the Greyhound ones. There are only so many things you can do with the design of a long-haul bus toilet. This example is from a bus from Washington DC to New York. A driver for the Dave Matthews Band admitted Wednesday that he emptied his bus' septic tank over the Chicago River last summer, drenching passengers on an architectural boat tour with 800 pounds of human waste. In a court hearing Wednesday morning, Wohl admitted that on the afternoon of Aug. 8, he discharged the septic tank while the bus crossed the grated Kinzie Street Bridge downtown, endangering about 100 sightseers riding the open-deck tourist boat passing under the bridge. Passengers on the tour boat, Chicago's Little Lady, described a downpour of foul-smelling, brownish-yellow slurry that ruined their clothes and made several of them sick. CHICAGO (AP) — The Dave Matthews Band, settling a lawsuit stemming from human waste dumped from a tour bus onto people touring the Chicago River, has agreed to pay $200,000 to an environmental fund and take measures to avoid a repeat of the incident, the Illinois attorney general said Friday. The band agreed to record when and where its tour buses empty septic tanks.